All uploaded data is password protected and encrypted via 256 bit AES. Sometimes we need some of your data files in order to diagnose or fix problems. You may also want to upload all of your data and application files so that you can use our application hosting service or if you suspect an imminent server crash and don't want to rely on just a local backup. 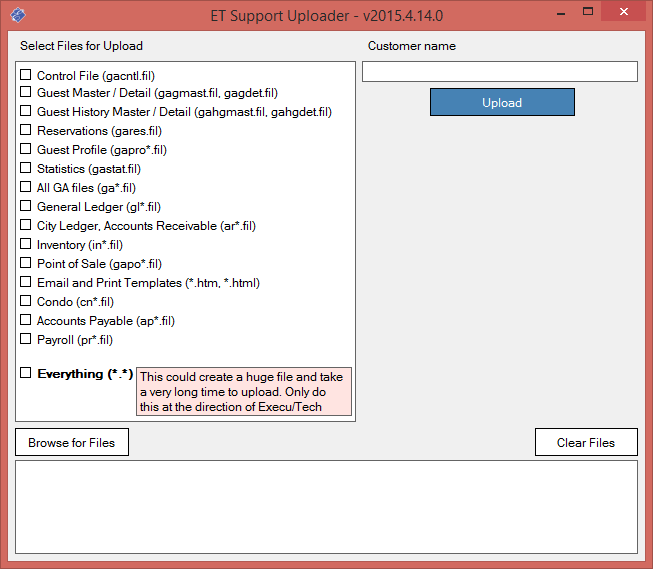 After uploading, Execu/Tech support will receive an email notifying them that your data has been uploaded. If this is an emergency situation where you need access to download the data to a new server for re-installation, we can provide you with a link to the data. This is not a backup service and should not be used as such. Uploaded files are deleted within 24 hours unless prior arrangements have been made. 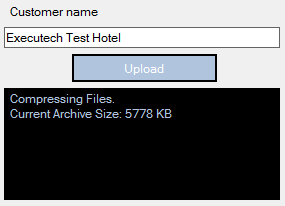 This application will make a copy of all selected files then compress them into an archive. Before selecting to upload "Everything" be sure that there is enough hard drive space available. A safe estimate would be 1.3x the currently folder size. While 99% of our customers will have plenty of available space, some customers running on older servers may not. Both the copy of the files and the archive are deleted after the upload completes. This application consists of 2 files and both are required. 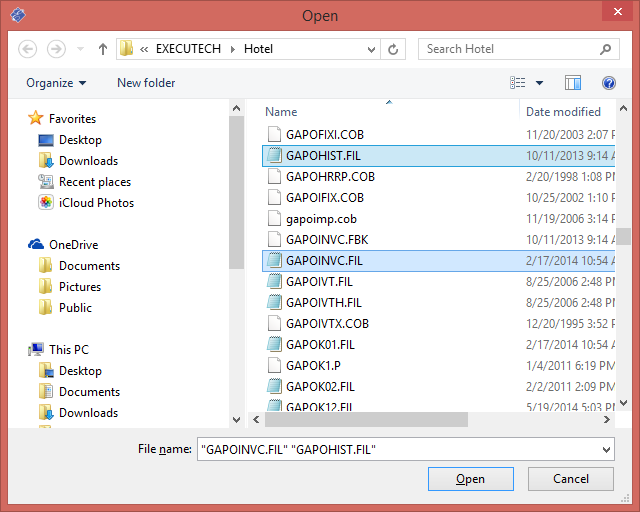 Extract these files into the software folder on the server. To run the uploader application, browse to the software folder and double click it. Once open, you'll see several options. You can select files from a list on the left, select specific files at the bottom, and enter your company name and upload on the right. 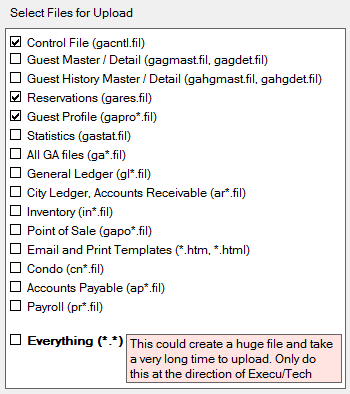 If the files you want to upload are in the list on the left, click them to select them. You can select as many as you wish. If you select "Everything (*. *)" you will be uploading everything in the Execu/Tech software folder. This includes anything you may have placed in the folder that's unrelated to Execu/Tech software. If you want to upload files that aren't listed or just a couple specific files, click "Browse for Files" and select as many as you need. After selecting the files you need, click "Open." You'll see the files you selected in the box at the bottom. You can repeat the step, above, as many times as you need until all the files are selected. If you need to clear the files in the box, click "Clear Files." Enter a company name so that your files can be identified by us. The file archive is created with a 15 character random string and without this company name, there will be no way to identify it. 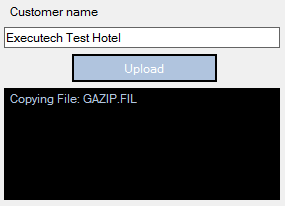 Click "Upload" when you're ready to upload the files to Execu/Tech support. You'll see a rolling status showing you the progress. Once the upload is completed, an email will be sent to Execu/Tech support with the necessary information. Your data archive will be deleted within 24 hours.